In our article on Under Floor Heating we introduced underfloor heating and its benefits. In this article we will focus on electric underfloor heating – most commonly used to heat one particular room such as a conservatory or bathroom rather than heating a whole house. Pictured above is a typical electric underfloor heating mat. This is an electrically insulated heating element mounted onto a fibreglass (or similar) mesh. With the heating element already spaced optimally, the mat can simply be rolled out and affixed to the sub-floor. The mat is supplied in a long straight roll just 5-10mm thick, but it can be manipulated to enable it to cover the free floor area in a room – as shown above in a bathroom. The mat should cover 85% of the available floor area. 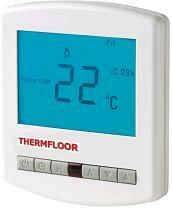 Underfloor heating mats are available with different power ratings for different uses – e.g. something around 200 Watts per square metre (200 W/m2) for primary heating in a room, 150 W/m2 for comfort heating on concrete bases, and 100-120W/m2 for comfort heating on wooden bases. The price difference between say a 120 W/m2 and 200 W/m2 heating mat is typically 10-20% only, but of course the running costs of a more power system will be much greater. With tiled floors, the heating element has to be covered with screed or tile adhesive before the tiled floor is put down. There is a relatively new type of carbon heating film designed for use with floating wooden/laminate flooring. The final flooring can be fitted directly on top of the film (which is supplied on a roll) which makes installation very simple. Note that the final electrical connection to the mains for an electric underfloor heating system must be made by a qualified electrician. Also, underfloor heating does not operate efficiently when under fitted carpets. Aside from the heating mat itself, the other key component of any underfloor heating system is the programmable thermostat controller. This controls the heating to ensure that it keeps the room heated to the desired temperature at the desired times of day. The better of these will have temperature sensors in the both the floor and in the air. When electric underfloor heating is fitted to a concrete subfloor in particular, insulation is vital. Otherwise heat from the system will conduct into the subfloor instead of radiating into the room. Insulated boards ranging in thickness from 5mm to 50mm+ are available. Good insulation speeds up the time it takes to heat up the room and also it reduces operating costs due to increased efficiency. 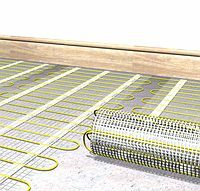 As electric underfloor heating is a relatively simple product to install, it is usually best to purchase the necessary components online, and then fit them yourself or have it installed by a general handyman or flooring expert. Complete kits are available including heating mats, insulating boards, thermostat controller, and all necessary cables and connectors. Expect to pay at least £30 per square metre for the heating system.